Is it time to clean those clogged gutters? Your local window and home cleaning experts can also take care of those nasty gutters for you. My Dad's Cleaning Service has cleaned the gutters of hundreds of local home and commercial properties. 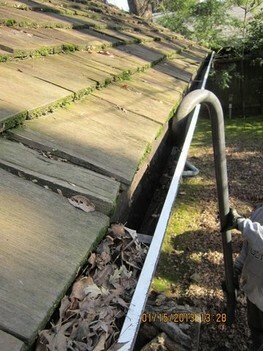 Periodic gutter cleaning is important for many reasons. Leaves and debris will collect in your gutters. As it accumulates, the gutters become heavier and bugs move in. Insects living close to your home's exterior may soon decide to start burrowing into the wood. Call My Dad's Cleaning Service to remove the debris and critters from your gutters. When clogged with leaves and debris, your gutters will no longer work to divert water away from your house and its foundation. Rain water will pool around clogged areas, and seep down to your foundation and into your property. Let My Dad's Cleaning Service handle your gutter cleaning and prevent resulting water damage! My Dad's Cleaning Service makes gutter cleaning simple. We have the technicians, ladders and tools to complete the job quickly and safely. We're also fully insured and licensed to complete the job. My Dad's Cleaning Service uses a vacuum system to clear your gutters from debris when applicable. This process enables them to work safely from the ground and yield phenomenal results every time. Don't risk injury or damage to your property. Call My Dad's Cleaning Service at (916) 625-6146 for a free gutter cleaning quote today.